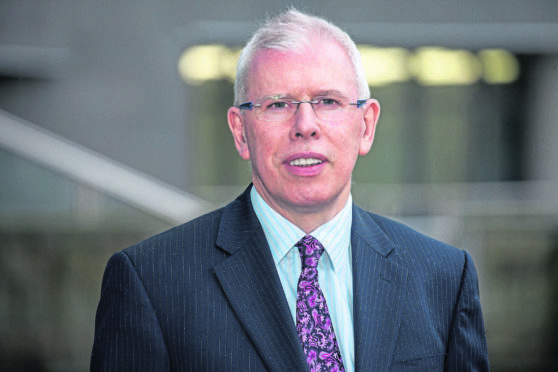 Mike Fleming, chairman of the board of governors at the Aberdeen-based university, said the decision to promote Professor John Harper without going through a “competitive process” was taken due to the “exceptional set of circumstances”. The remarks, contained in a leaked memo to staff, were made after the University and College Union (UCU) Scotland criticised the failure to hold “any recruitment process” for the top job. Prof John Harper, who was previously deputy principal, will succeed Ferdinand von Prondzynski at the end of the month, after the outgoing boss decided to step down on Thursday amid a row over his business links. The shock resignation followed an internal investigation which found that Prof von Prondzynski had breached RGU’s conflict of interest policy during the recent appointment of vice-principal Gordon McConnell. An inquiry ruled that that the two former Dublin City University (DCU) colleagues had failed to declare during Professor McConnell’s recruitment at the end of last year that they were co-directors of a firm which owned a £12million castle in Ireland. The board decided last month that it was a “genuine omission or oversight”, but the P&J later revealed the decision not to sanction the pair had plunged the university into turmoil, and prompted fellow vice-principal Paul Hagan to quit in protest. Prof Hagan has now withdrawn his resignation in the wake of Prof von Prondzynski’s decision to leave after seven years in charge. But the handling of the appointment of Prof Harper to succeed Prof von Prondzynski immediately sparked a fresh row about the way senior staff are recruited. On Thursday, UCU Scotland official Mary Senior accused RGU of “shoe-horning in” the new principal “without any recruitment process”, and that it was “particularly galling to see this jobs for the boys approach” amid calls for greater diversity at the top level of higher education. Moving to reassure RGU staff in the wake of the remarks, Mr Fleming wrote: “Following the UCU comment on the recruitment process of Professor John Harper to principal, I would like to reassure you that the appointment was in line with the university’s procedures and complies with the Scottish Code of Good Higher Education Governance. “There was full involvement of the board in the appointment and the governors were unanimous in their decision to ask John to step up to the role of principal. “It collectively took decisive action to secure stability and continuity for the university community with the direct appointment. The e-mail added: “The board is very aware that normal custom and practice is to go through a competitive process, particularly when recruiting at this level. Last night, Aberdeen Central MSP Kevin Stewart paid tribute to the outgoing principal and welcomed his successor. He said: “During his time in charge at RGU, Ferdinand has done a tremendous amount to boost the profile of both his university and this city as a whole. I am disappointed to see him resigning. A spokesperson for Robert Gordon University said: “We are disappointed that UCU continues to misrepresent the action that the Board of Governors has taken. “The Board acted decisively to stabilise what was a difficult situation for the university. “There was full involvement of the Board in the appointment and the governors were unanimous in their decision to appoint Professor Harper who has the overwhelming support and confidence of both the Board and the staff. “The Board and Professor Harper mutually agreed a two year fixed-term appointment to give him time to deliver the stability and move the university forward with its ambitious plans in teaching and research. Robert Gordon University is refusing to disclose whether Ferdinand von Prondzynski will receive a six-figure pay-off when he leaves the top job at the institution. RGU policies state that the maximum severance compensation that can be offered is one year’s salary, and Professor von Prondzynski was reported to be earning £278,000 as principal. But a spokeswoman for the university would not be drawn on the terms of any pay-off yesterday.